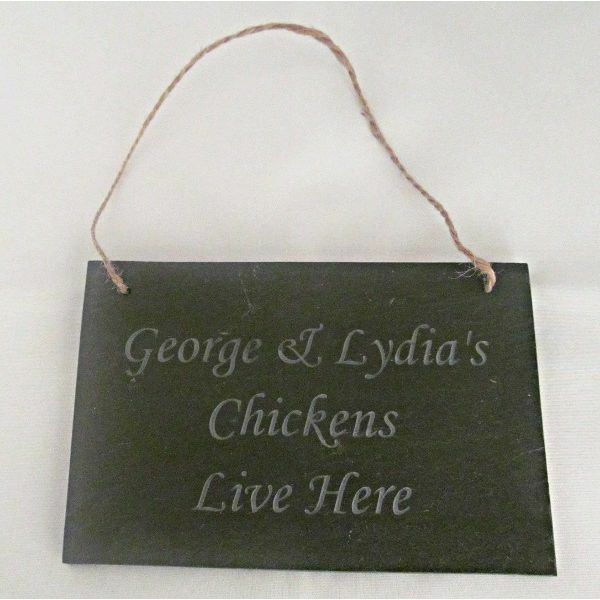 This engraved chicken coop sign is approximately 15cm by 10cm. The price of the chicken coop sign includes engraving of a name to personalise the sign, above the text Chickens Live Here. The text on the chicken coop sign is left as natural slate. The engraved chicken coop sign is a hanging sign, but if you prefer, it can be supplied with screwholes on each side so you can fix to your chicken coop. The postage rate for the engraved chicken house sign is Band A.